Some genera, especially of the neotropical Gesneriaceae, exhibit a wide range of pollination syndromes, e.g., Sinningia (bee-, euglossine-, butterfly-, moth-, hummingbird- and bat-syndrome), Achimenes (bee-, euglossine-, butterfly-, hummingbird-syndrome), Kohleria (bee-, euglossine-, hummingbird-, bat-syndrome), Gesneria (hummingbird-, bat-syndrome). In the Sinningieae (Gesnerieae-Ligeriinae) nectar sugar composition in relation to pollination syndromes was studied in detail. In the hummingbird and bee flowers (representing 95% of the species), nectar was found to be sucrose-dominant with an average sugar concentration of 23.9 ± 10.6% and 28.7 ± 10.6%, respectively. The nectar of the sphingophilous and chiropterophilous flowers differed significantly in the hexose (fructose + glucose) dominance, with a low sugar concentration (7.1 ± 3.4%) in bat flowers (Perret et al. 2001). In the Old World Gesneriaceae, genera that exhibit wide ranges of pollination syndromes are rather rare. An example is the genus Petrocodon that seems to include different forms of melittophily, ornithophily, psychophily (butterflies) and/or sphingophily (hawk moths) (Weber et al. 2011). Petrocodon is a rare example in the Old World Gesneriaceae of a genus exhibiting multiple pollination syndromes. 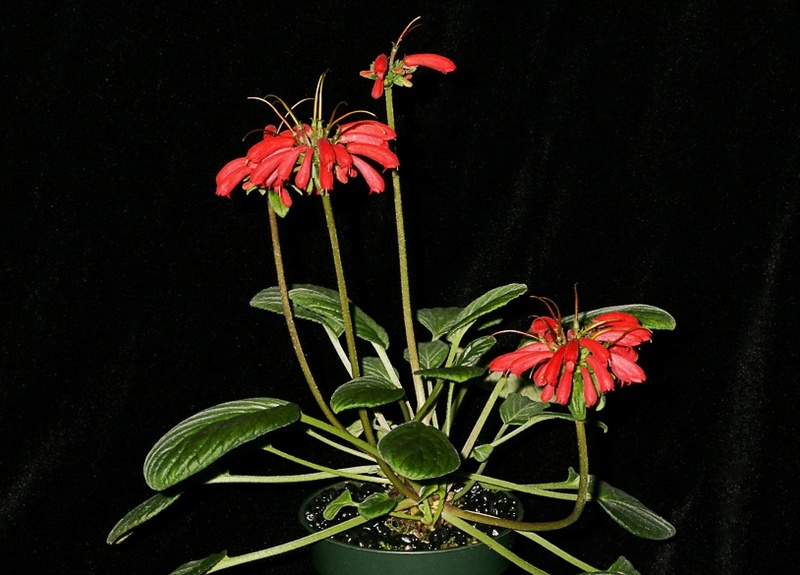 Given its red color and tubular form, it is likely that this species, P. coccinea (formerly Calcareoboea coccinea) is bird-pollinated.